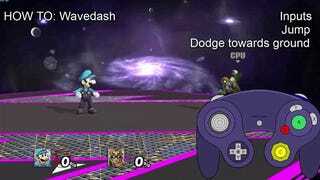 Throwback: How To Wavedash In Super Smash Bros. Here's a new trick for those of you that never learned how to do the famous technique in Melee: a GIF that clearly shows the inputs necessary to perform a "wavedash." Wavedashing, as you might know, is when someone performs a sliding motion while still being capable of doing ground attacks available to you while standing still. It's a famous advanced technique which can often be spotted at high-level play. While in the air, air dodge at an angle towards the stage. Wavedash is a technique that is performed by air dodging diagonally into the ground, causing the character to slide a short distance. It allows players to perform any ground action while moving horizontally on the ground. Contrary to popular belief, wavedashing is not strictly a glitch; it is more accurately a corner case of Melee's physics engine. When air dodging diagonally to the ground, all of the momentum of the airdodge is transferred into horizontal (ground) movement, since the character can no longer fall. Additionally, performing a wavedash causes the game to recognize the character as landing from the helpless state due to air dodges causing the state. 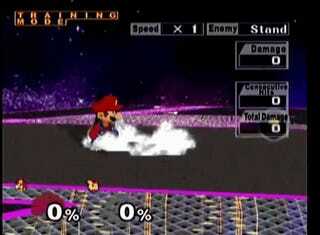 Thus, the game is not recognizing wavedashing as a specific "technique" (such as an attack or movement) but as if the character simply landed and stood still; the sliding effect is due to the "slipperiness" inherent in the game's engine. While in a wavedash, the character is considered by the game to be standing - thus, they can perform any ground attacks that could normally be performed from a standing position, such as smashes, standing grabs and jabs. The character also retains all of their standing defensive maneuvers such as sidestepping and shielding. With this extra utility, wavedashing enables a moving versatility dashing can't match. Another advantage lies in the ability to wavedash backwards while facing forwards, which allows characters to perform standing attacks while moving both backwards and forwards. This is helpful for mindgames, especially with characters with longer wavedashes. This technique also allows relatively safer retreats from opponents, and should the player fall off the stage with the wavedash, they will immediately grab onto the ledge, giving rise to a powerful and fast edgeguard option.